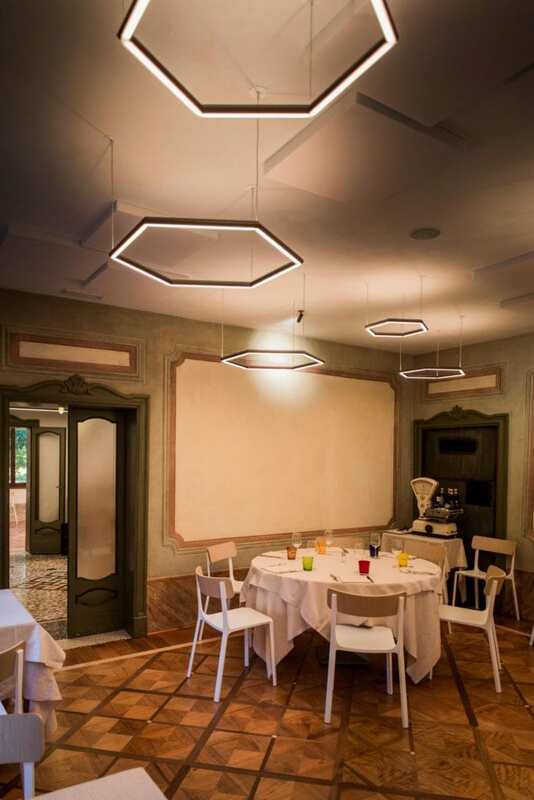 This dynamic Olev lighting designed by Architect Roberto Busellato allows the owners of the restaurant “Ristorante Remo” to freely change the arrangement of the tables, transforming the atmosphere according to the event and the moment of the day. 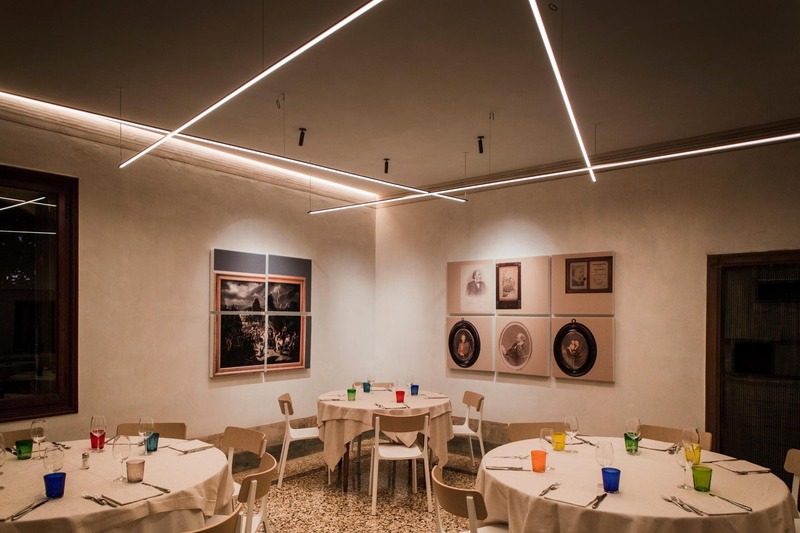 Ristorante Remo is the fascinating result following a conservative restoration of the historical Villa Cariolato in Vicenza. The Villa belonged to Domenico Cariolato, an officer of the thousand volunteers that took part in the 1860 expedition led by Giuseppe Garibaldi. It is said that Garibaldi himself slept in one of the rooms in the Villa. 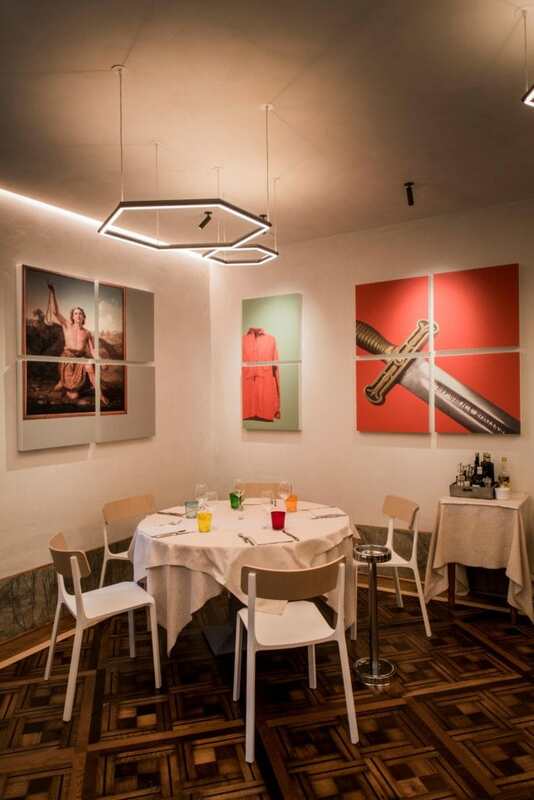 Gianluca and Alver Baratto, the owners of the restaurant, wanted to create a dynamic environment, where they could freely change the arrangement of the tables. “Initially, we wanted the lighting to focus on the tables. But then we realized that we needed a different solution because the tables are actually very dynamic. We move them according to the event, the occasion, the moment, or the season.” says Gianluca Baratto, the owner. “The greatest gamble was to illuminate the tables without creating shadow cones on the table guests, whichever their position in the room. Besides, it was essential that the light temperature heightened the colours of the food in the dishes and of the mise en place”, explains the Architect. “Using three types of lighting fixtures, each with its own different way to treat light, seemed to be the best choice from the beginning. 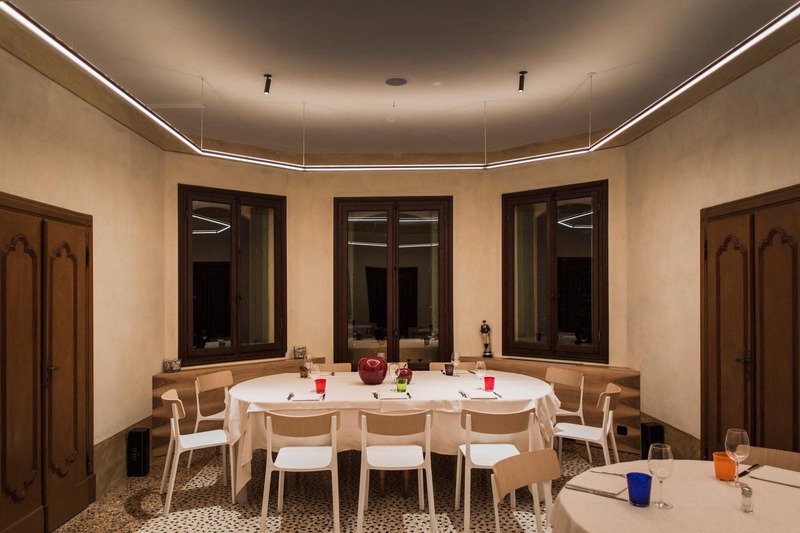 In perfect tune with Andrea Lanaro from Olev, we chose a lighting fixture that was not invasive, but modern, and could easily adjust to the changes in the halls. I found it extremely interesting that, thanks to Olev’s customization, it was possible to obtain completely different shapes from a single profile – the elegant hexagonal bar”. But the customization didn’t stop to shapes and sizes. To transform the atmosphere of the environments according to the moment of the day or the kind of event, all the lighting fixtures have been equipped with dim-to-warm technology. Dim-to-warm technology allows to control light intensity in relation to colour temperature – by increasing its intensity, the light becomes cooler, and by decreasing it, the light becomes warmer. Thanks to this technology, the owners can adjust both light intensity and temperature colour themselves, and, as a result, transform the atmosphere from exclusive business cocktails to a romantic dinner for two. 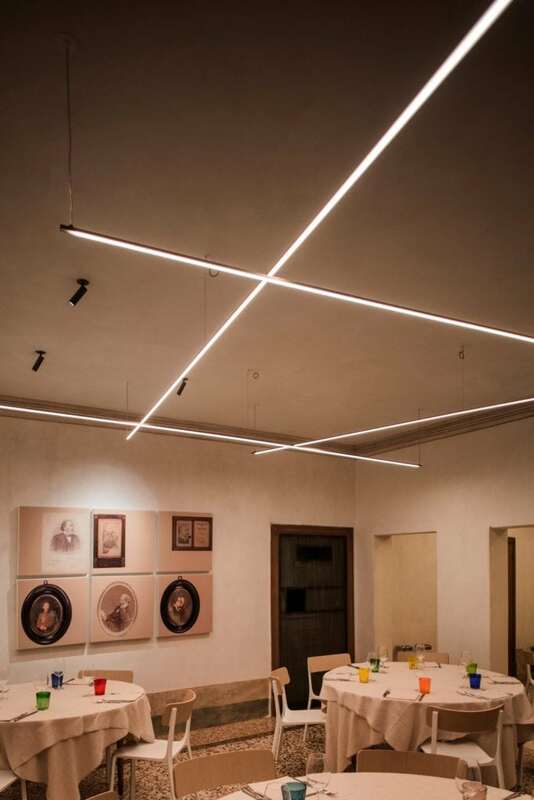 Another feature that characterizes the lamps chosen for this project, is their ability to diffuse downwards direct light and upwards indirect light, with separate dimmers. Going up the entrance stairway, the guests undertake an actual discovery path, where light is the undoubted protagonist. The Olev Poly Esagono, designer pendant lamps with different sizes and heights, add movement and personality to the settings on the ground floor. The modern lighting creates a harmonious liaison with the classical but timeless style of the furnishing and the floors. Long LED profiles hanging from the ceiling illuminate the halls on the first floor, crossing and creating a game of perspectives. The light is reflected on the walls, which tell the story of the young Garibaldian Domenico Cariolato, former owner of the Villa. This isn’t just a gastronomic journey, but a historic and cultural one as well. A single LED profile follows the perimeter of the great hall on the first floor, creating a cross-reference between the ceiling and the restored antique floor. To make the interaction between the contrasts even more interesting, Architect Busellato has chosen to complement the diffused light of the pendant profiles with some adjustable LED spotlights. 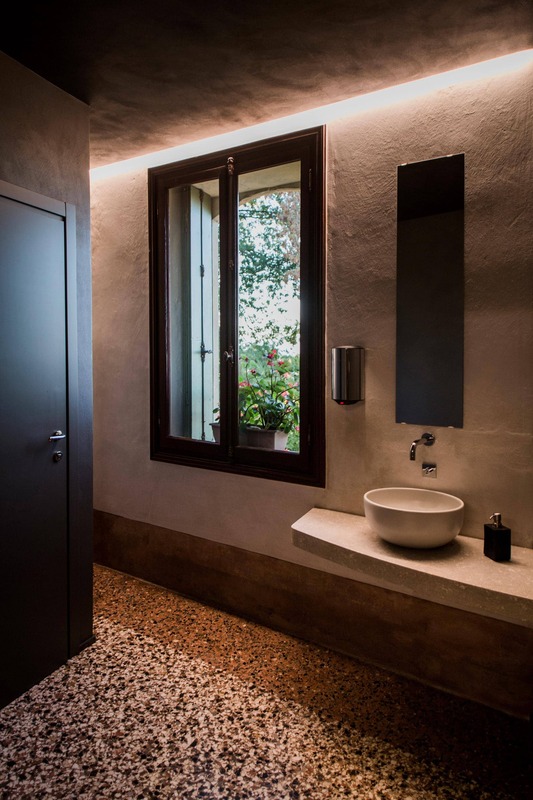 The LED strip lights diffuse a warm light that brings out the elegant design of the modern and minimal restrooms. The light is projected onto the walls, creating a grazing effect which results in an intimate and moody atmosphere. 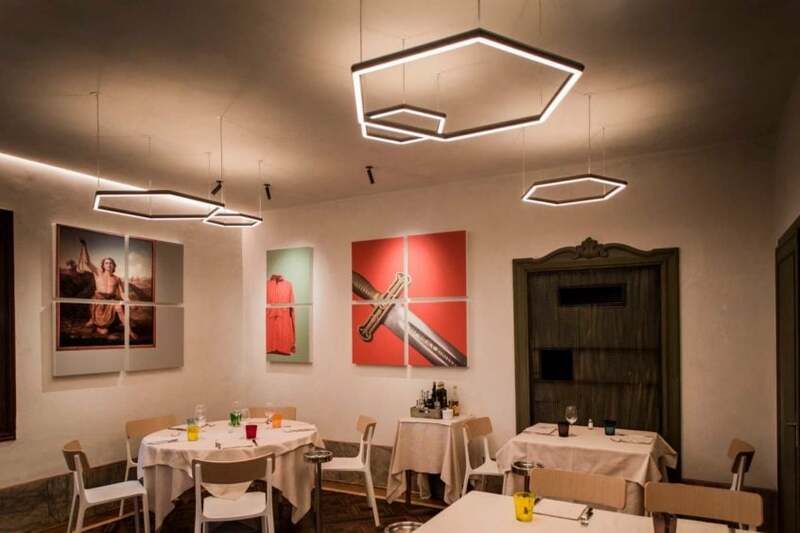 Are you a restaurant owner and you want to find out how a dynamic lighting design can help you customize your place depending on the kind of event, and become the top choice of your customers?